It’s time for another giveaway, and this time we are celebrating halloween with twice the treats! We are giving away a pair of copies of two D&D books to a lucky reader! Only the cool folks at Gator Games make things like this happen. We are giving away new copies of two 4e classics, the DMG 2 and the MM 2. 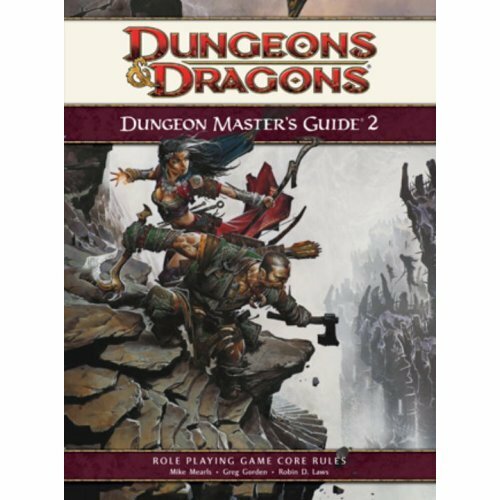 I personally find the DMG 2 to be a great book for DMs by the way, you can’t go wrong with that book. How to enter? Well, leave us a comment here on the post, and send us a tweet via twitter, to both @newbiedm and @gatorgames, and you are entered. It’s that simple! The contest will run from October 24th until Saturday October 29th 2011, at 11:59pm pacific time. I’d love to get back into D&D, haven’t played in years. Sign me up! I would be very interested in winning these items. I am extremely curious to see what all they put in the DMG2. I currently am running an Essentials campaign, but could expand my 4E library. And free loot is always good; better than bacon and that’s saying alot. As a new DM who doesn’t have either of these two books, I’m delighted to enter! Twittering over in a sec. Hey there from the east coast. Those are the 2 books I DON’T have yet. Which is weird cause I have book 1 and 3 respectively. Thanks for the chance to win something. Yay for FLGS online stores! I got a cheap copy of Shadows over Bögenhafen (WFRP) thanks to used collections just like those. Anyway, count me in for that contest. Would love a copy of the DMG2 to add to my collection. I’m looking to finally run my first game with friends soon, and this would be a huge help! Giveaways are always great, especially when they’re for stuff I don’t own! Heck yeah I want free stuff! I would love to win! And thanks for the chance to! Ooo! Me! Me! I’ve just started DM’ing a campaign for my daughter and her friends — what better service can I render geekdom than by indoctrinating — er, INTRODUCING, I mean — six girls into the world of Dungeons and Dragons? And the books would SO help. Definitely wouldn’t mind either of these books on my shelf, and contests are cool. Sign me up. Free classics are great! Would love these for my collection. I’m looking to expand my library like most people entering this contest, and this would be a huge help! I always wanted the DMG2! Hi there! I just got into D&D after a long time of wanted to play. I had the red box way back in the 80s and always wanted to play, but everyone was into either Battletech or Marvel Super Heroes RPG….so sadly, my little red box of D&D never got used. I have played a few encounters with a friend and am bummed I wasted all those years not playing. I would love to add these books to my library! The 4e DMG and 4e DMG2: Two of the greatest gaming books ever written that no one seems to have actually read. The tweets by @GatorGames and @newbiedm are worth the reading. They are a great way to learn what’s happening and to win great stuff! I’d love to get these two books I don’t have yet. Thanks for hosting the contest. When is the newbiedm podcast coming back? I got all excited and fouled up my email address. This post has the right one. Ooooh, I knew there was a reason I hadn’t gotten around to picking up these books yet. Consider me entered! Maybe it will be my lucky day. Oooh, would be nice to get these! You know, the MM2 is one of the only D&D4e books I don’t own? Therefore, I have to win this time. Please put me in for this great opportunity. Thank you both to Gator Games & Newbie DM for putting this together. Woo Woo! a 4E book would be great – I just got into a group playing AD&D 2e but there are a few rpg noobs I would like to try and run a 4E campaign with! My next campaign is going to be epic. Here’s the soundtrack: http://tny.gs/saapKm . Inspired by Aztec, Hopi and Markahuasi culture, I pulled all the names from the Nahuatl language. Commenting! 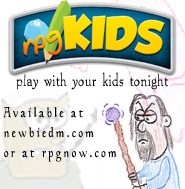 Looking forward to using RPGKids soon!